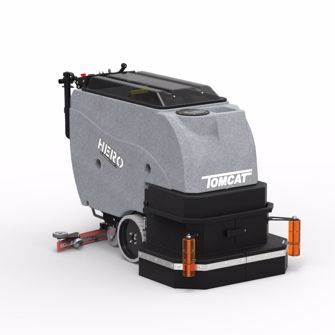 Tomcat’s Hero commercial floor scrubbers exceed expectations with a run time of up to 5 hours and the ability to clean 23,000 square feet per hour. It would make a great addition to just about any facility – school systems, healthcare, warehouses, grocery, retail, arenas and many others! You’ll not see marks on your walls with large polyurethane rollers protecting the scrubber deck of the Hero. It is available with a Traction drive that includes a powerful all-gear transaxle to make climbing ramps easier and operation effortless. You can choose from three different scrub head types, all with different features and benefits. Vacuum Muffler – consistently achieves 62 dBA. Front Fill System – has a retractable hose and stainless screen. An oversized vacuum screen shut-off stops overfill issues and protects the vacuum motor. Scrub Pad Width: 30" and 34"
Dimensions (LxWxH): 55" x 26" x 40"
Scrub Pad Width: 39" and 33"
Scrub Pad Width: 28" and 32"